Sign in to StaffHub at https://staffhub.office.com/ with your Office 365 work account, such as rob@contoso.com. The first time you sign in, the setup wizard will start. If you have already created a team and want to create a new one, click your profile on the upper right of the screen, "Switch Team" in the drop-down, and "New Team" on the upper right of the screen. Follow the steps in wizard to create a team and then add members on the schedule. 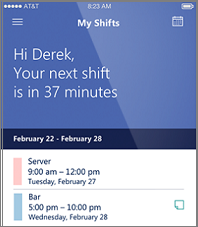 Send an invitation to each employee so they can download the app Microsoft StaffHub and see their schedules. Make sure employees have their Office 365 work account and password so they can sign in to the app. If you allowed StaffHub to self-provision accounts, the employee can create one directly in the app. To create your work schedule, after adding team members, assign shifts to the members. Press Share with team for the schedule to be made available to each team member via the mobile app or right click on a shift and press "Share" for an individual shift to be made available to the applicable team member. Select Team in the top navigation menu. Select the team member you want to promote, and in the panel, toggle on Admin. For instructions, see Print your StaffHub schedule. Please let us know what you think about Microsoft StaffHub. We'd love to hear your suggestions and feedback! Suggest idea.